Octopus can be a little confronting for some people, for various reasons - and the flavour is rarely blamed (probably because it's delicious). I have a couple of friends who will eat big octopus tentacles but not whole baby occies, and vice versa. Neither group can explain the reason. And for the record, what is sold as baby octopus is actually a variety that only grows to a small size. I like both, although I prefer the littlies, which I've used in today's recipe. Whichever you prefer, if you allow it to sit in this spicy Korean-style marinade for a couple of hours, you'll end up with a tender, tasty treat. Toss it on a hot barbecue for a few minutes and you're on a winner. If you aren't a fan of chilli heat, omit the paste and flakes (or reduce the amount) and use just the ginger and garlic for flavour. Clean octopus if not already done, making sure you remove the small beak. Combine all ingredients except the garnish in a glass or ceramic bowl, cover and refrigerate for at least an hour. 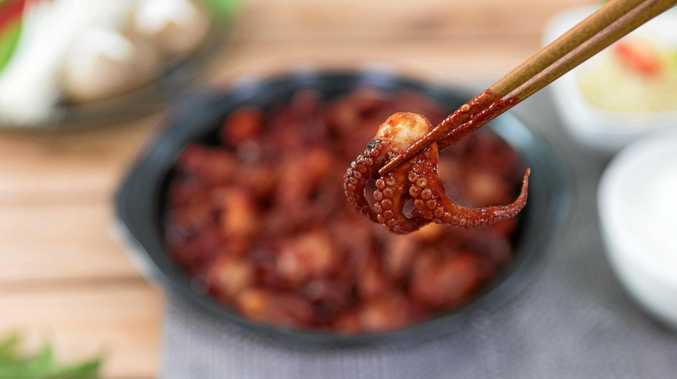 While octopus is marinating, soak three or four thick bamboo skewers in water. Preheat barbecue to high heat. Remove octopus from marinade and allow to drain. Thread on to skewers and cook over high heat for about 3-4 minutes per side or until cooked through. Garnish with cucumber and fresh chillies and serve immediately.